When I lived in New Hampshire, for the twenty years prior to the turn of the century, I grew blueberries on my land in the little town of Rumney, a stone’s throw from Stinson Lake on the edge of the White Mountains. As a pie maker and food writer, I felt fortunate to have a steady supply of berries, both high bush and low, for much of the summer season. Though no less fortunate than my neighbor, Woody, whose favorite pastime was pilfering my berries in a cat and mouse game that went on for years before I moved away. Woody liked the high bush berries best. 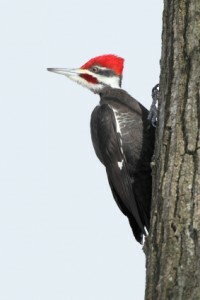 And when he made a run for them -swooping through the front yard in that shallow, wave-like flight pattern common to woodpeckers – he announced his arrival with the staccato song we all know from the cartoon. By the time I’d rounded the woodpile and started in his direction, he’d be nibbling away, branch and woodpecker body bent nearly parallel to the ground under his considerable weight. Woody and I eventually worked out an arrangement that suited us both: I’d keep my distance for a minute or two while he grazed. And he’d move along as soon as I hurled the first cuss. 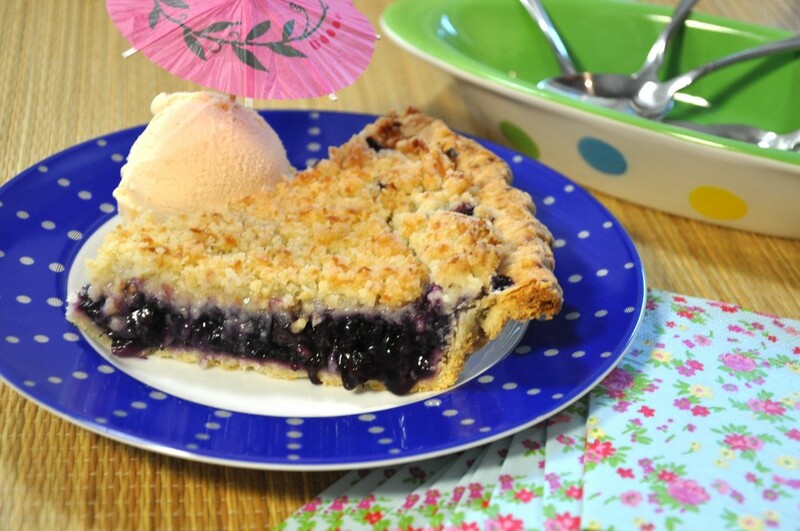 Blueberry pie has never tasted quite so good – a high spirited rivalry for your food supply will do that – but I still love blueberry pie as much as I ever did. I’m going to miss blueberry season. This pie is my sendoff, but I’m comforted knowing that it’s perfectly good made with frozen (and partially thawed) blueberries as well. Keep that in mind this winter, when it’s ten below zero, your driveway is covered with snow and you’re craving a dessert that reminds you of white sand beaches, warm tropical breezes, and a certain cold adult beverage with a cute little umbrella stuck in it. I’m frequently asked about the best way to store fruit pies, to keep them at their prime. And the simple answer is this: you can’t keep them at their prime. And since you can’t, you’re better off simply eating them in their prime. Keep your cooling fruit pies well ventilated. My favorite cooling rack sits 4 inches off the counter and allows for ample ventilation underneath. “Prime” for most fruit pies is a very small window, and it’s open for just a few hours between the time it is barely warm and then completely cooled. 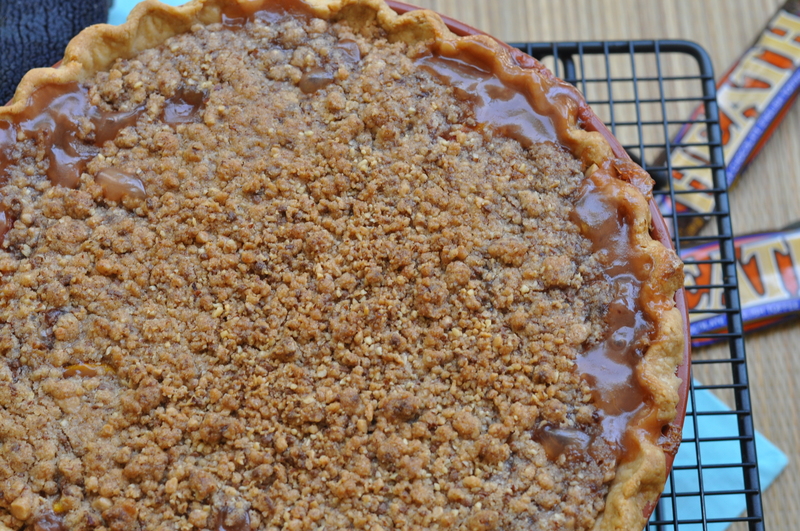 It’s your pie’s honeymoon period: the bottom crust is still crisp and the top crust is flaky. If there’s a crumb topping, it still has an irresistible crunch. The juices have developed just the right amount of body. The flavors are fresh, everything is perfect. Slowly but surely, moisture rears its ugly head and starts to undo what you’ve worked so hard to create. The moisture in the filling starts to soften your once crisp bottom and top crust. Humidity begins to un-crisp your crunchy topping. The filling still tastes great, but the package isn’t quite the same. What’s a pie maker to do? First of all, just accept this as a fact of the pie maker’s life. It will encourage you to think about the importance of timing and how it impacts your pies and the people you feed them to. Are you serving your best peach pie to cap off a late afternoon holiday barbecue? Then time it so you’re pulling it out of the oven just before your guests start to arrive. Most fruit pies will do fine simply left at room temperature for 24 to 36 hours. Both the sugar and the acidity of the fruit and lemon juice will keep the pie from spoiling. Don’t cover the pie with foil, plastic wrap, or anything else: this will only trap moisture and soften the crust and crumb toppings. If you’re worried about critters getting to your pie, use some sort of screened cover to protect your pie. Or put it in an upper cabinet. Storing pies in a ventilated cabinet known as a pie safe is part of the American pie making tradition. Refrigerating your fruit pie will extend its shelf life, but the humidity will only hasten the demise of your crisp topping and flaky crust. Freezing individual slices and then warming them in the oven, uncovered, is a better option. This fall at The Pie Academy we’ll take a closer look at the ins and outs of freezing both baked and unbaked apple pies. PASTRY NOTE: If you don’t have a favorite pie pastry of your own, I recommend either the GOOD BASIC PIE DOUGH or the FOOD PROCESSOR PIE DOUGH. On a sheet of lightly floured wax paper, roll the pastry into a 13"circle. Invert the pastry over a 9 1/2" pie pan - (not deep dish, like I typically use) - center, and peel off the paper. Gently tuck the pastry into the pan, without stretching it, then shape the edge into an upstanding rim. Crimp or flute, if desired. Place in the freezer for 15 minutes while you make the filling. Preheat the oven to 375°. 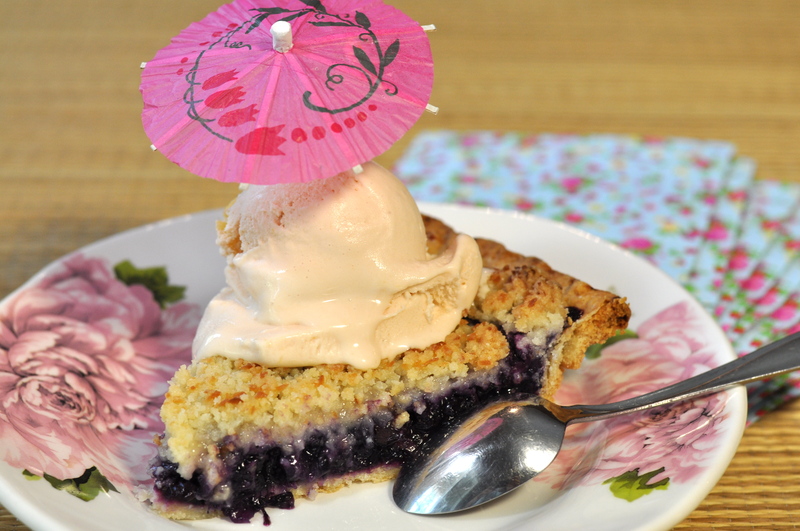 Make the filling: Combine the blueberries, pineapple, and pina colada concentrate in a large bowl. Mix the sugar and cornstarch together in a small bowl, then stir into the fruit. Stir in the rum or amaretto, if using, extract, and salt. Turn the filling into the chilled shell and smooth the filling with a spoon. Place the pie on the center oven rack and bake for 25 minutes. While the pie bakes, make the coconut topping. Put the flour, coconut, sugar, and salt in a food processor and pulse several times, to mix. Scatter the butter over the top and pulse until the mixture forms gravel-like crumbs. Dump the crumbs into a large bowl and rub well by hand to form large, buttery crumbs. Refrigerate. After the initial 20 minutes are up, remove the pie and place it on top of your stove. 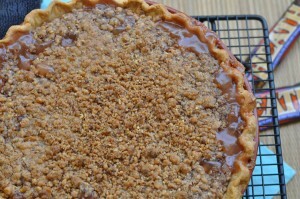 Carefully spread the crumb mixture on top, spreading it evenly. Gently tamp the crumbs, to flatten slightly. Put the pie back in the oven and bake 10 minutes more, then reduce the heat to 350° and continue to bake for 15 to 20 minutes, until the juices bubble thickly and the top is a rich golden brown. Cool throughly on a rack. Makes 8 to 10 servings.